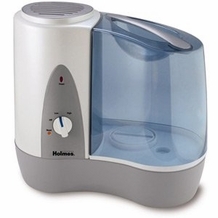 The Holmes Warm Mist Humidifier HM5082 is a filter free, warm mist humidifier. Also known as part number HM5082-U, it features a 2-speed setting and digital humidistat that allows the humidifier to run up to 24 hours per filling. The Holmes HM5082 Humidifier provides relief from a few harmful effects associated with arid indoor air. This filter is perfect for small rooms and your child's nursery. The Holmes HM5082 Humidifier has a dishwasher safe base and is imbedded with Antimicrobial Product Protection treated to key plastic parts. With an output of 2.13 gallons the Holmes HM5082-U increases the benefits of good air quality.